At the Installation Path step of the wizard, choose the installation directory. 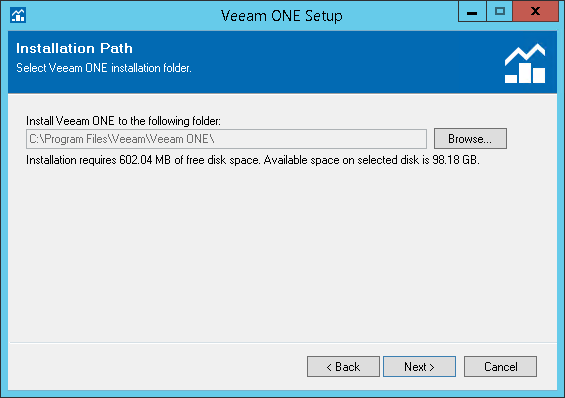 In the typical installation mode, the setup installs all components to a single directory and creates a subdirectory for every Veeam ONE component. The typical installation requires around 550 MB of free space on a disk (plus additional space if you choose to install Microsoft SQL Server instance on the same machine). Be aware that depending on the size of your virtual infrastructure and frequency of data collection, the database may grow large and require more space. Be sure to adjust to this condition by freeing up more disk space when needed.